How do I tie my belt? Where do my patches go on my uniform? What is the basic hand drill technique? Class cancellation will be announced via email, and our Facebook page. In general we will follow the South East Polk School District and how they handle evening activity cancellations due to weather. Where do I my patches go on my uniform? 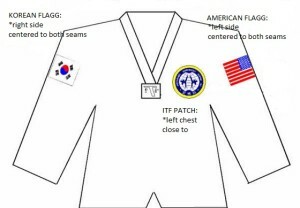 Korean Flag goes on right sleeve (directly under horizontal seam, centered to vertical seam), American Flag on left sleeve (same as other side). ITF patch (circular patch), on left chest just next to seam. The ITF patch is a little difficult for the small uniforms, please do your best to make it look as good as possible.